The striker has missed Chelsea’s last two matches against Crystal Palace and Maribor with a groin problem and a virus, which saw him hospitalised. 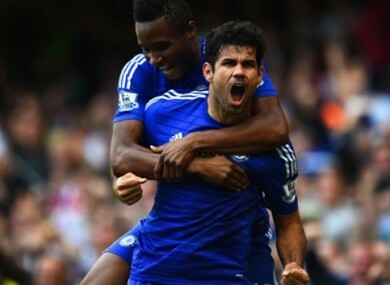 Costa has scored nine goals in seven matches this season. JOSE MOURINHO SAYS that he is prepared to take a gamble on Diego Costa for Chelsea’s Premier League clash with Manchester United on Sunday – provided that the striker can come through a training session unscathed. Costa has missed the Blues’ last two matches against Crystal Palace and Maribor after returning from Spain duty with a groin problem and then contracting a virus which saw him hospitalised. But Mourinho revealed on Friday that Costa still had a “little chance” of making an appearance at Old Trafford and the Portuguese insists that he would not hesitate to include the Premier League’s joint-top scorer in his squad if he proves himself fit enough. Chelsea are already without striker Loic Remy, who is expected to be sidelined for at least two weeks with a groin problem sustained against Maribor, while Didier Drogba is still short of full fitness. Andre Schurrle, however, should return. Email “Mourinho ready to risk Costa against United”. Feedback on “Mourinho ready to risk Costa against United”.